Author of new book The Power of Less Leo Babauta advises readers to simplify and focus only on the essential. Today he stopped by to tell us more about his timely message. Lifehacker: In a culture that encourages the acquisition of things like gadgets and the idea of "living life to the fullest," what kind of paradigm shift is required to move from the "more is more" to "less is more" ethos? How does one shift their life into working with less without feeling deprived or limited? Leo Babauta: I think the "wanting more" mode of thinking is attractive, because of the pull of the media and advertising that give us these images of very attractive things. The paradigm shift comes when we realise that while we might want to do and buy everything, we simply can't. We might want to do a million tasks a day, and take on every project idea that comes our way, but we just can't — and what's more, our lives suffer from trying to do too much. Something is always sacrificed — whether that's time with loved ones, exercise and health, time for ourselves, or pursuing our dreams. When you make this realisation, simple becomes more attractive. Space in our schedule, a more relaxed pace, quiet, more time for things that are fun, the freedom to pursue projects that we're passionate about ... these things have great appeal. And these things come when we learn to set limits and focus on the essential. A great side benefit? You become more effective and productive, in the sense of accomplishments, not cranking widgets and being busy. I'd like to point out that "living life to the fullest" doesn't require having and doing more. My definition of living life to the fullest means doing things I love doing, spending time with people I love, being passionate, enjoying each and every moment. And this doesn't require acquisition or doing everything ... it requires the desire to focus on what really matters, and not simply on everything that comes our way. When you do that, you don't feel deprived, because life becomes more enjoyable. LH: Your book advises readers to focus only on the essential and cut out the rest. But most people with crazed, busy lives might say that everything they do IS essential—to pay the bills, to raise their children, to please the boss. When you audit your daily life, how do you know what's really non-essential? What's the criteria? LB: If they have crazed, busy lives, they probably already recognise the need to change something — lives like that are difficult to sustain and not always fulfilling. Once you recognise the need to make a change, it's just a matter of figuring out what needs to change — are you going to try to keep doing everything and live that crazed life, or are you going to make some tough decisions and prioritise? Because these decisions aren't easy — but if you make small, incremental changes, it doesn't have to be overwhelming either. First, I recommend people step back and take a big-picture look at their lives. That means making a list of everything you do, all your commitments, all the things you'd like to do and plan to do in the near future. Then, from this list, make a Short List — just 4-5 things that are MOST important to you, that you love doing most, that you're most passionate about, that are most in line with your life values. This can be pretty difficult if you have a long list of things you want to do, but again, you either need to make the tough choices or try to do everything, which I don't recommend. Once you've made your Short List, compare everything on the long list to the Short List, and decide which things don't line up with your essentials. These are the non-essentials, and you need to try to eliminate them to make room for the essentials. Second, the changes don't need to be made overnight, so while you might feel the need to pay the bills instead of doing work you're passionate about, you can slowly try to transition to that passionate work, rather than pay-the-bills work. I did this and quit my day job a year ago, but it took me a year of transition. Major changes like this don't happen overnight. There are smaller changes you can make immediately — tell people you can't take on a project, serve on a committee, play or coach on a team, etc. This will free up some time in the short-term to make longer-term changes. LH: Does constantly saying "no" to things to focus on doing less make one live her life on the defensive, constantly protecting her free time and resources instead of embracing new things? LB: It can be that way, if you say "no" to close yourself off to new things and remain defensive. I don't recommend it. Instead, you can use "no" and limits to guard your time ... so that you're free to pursue things that excite you. If you say "yes" to everything, you don't have time for new things ... you're too busy! I've found that simplifying my schedule allows me to do things that I never thought I could do before — getting in shape and running three marathons (and a couple triathlons), changing careers so that I'm now a full-time blogger, travelling with my wife, writing and publishing a book, becoming an entrepreneur. These things would never have been possible if I kept saying "yes" to everything, and if I never learned to free up my time by making the tough choices and saying "no" to things that didn't match up with my dreams and values. LH: Do you think actually completing fewer tasks—but doing so in a fully-present, effective way—makes you more productive than someone who completes more tasks "well enough" but is run ragged at the end of the day? How did you do juggling your blog, book manuscript, and family? LB: There's no doubt in my mind that I'm much, much more effective these days now that I've learned to focus on one task at a time and really pour myself into each task, each moment. Not only that, I'm much happier, less stressed, and more satisfied with my work and life. I used to be busier — trying to do too much, taking on lots of different tasks and projects at the same time, working long hours, taking in more and more information and communicating rapidly and constantly — and at the end of the day, of the month, and of the year, I had very little to show for it all. I was churning my wheels but going nowhere. These days, I actually complete the important tasks, and the work I do goes a long way. I finish each day feeling like I got a lot done. How do I juggle my blog, book writing, and family? By doing one thing at a time. I cleared my schedule to write my book — it was too hard to try to do the blog and book at the same time (I was also trying to do marathon training and planning for a wedding and honeymoon). So I cleared everything else and focused on the book. My blog is just a series of tasks that I do one at a time. And when I make time for my family, every day — my family time is inviolate — I do only that. I don't do Blackberry or iPhone or any other work or email when I'm with my family. I leave everything else behind. One thing at a time. That's been a godsend for me. 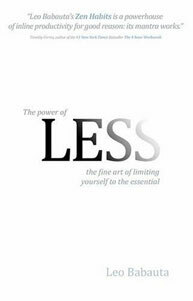 Leo's book, The Power of Less: The Fine Art of Limiting Yourself to the Essential, is available on Amazon and at bookstores everywhere. For a free taste of what's inside, download the free Thriving on Less companion ebook.